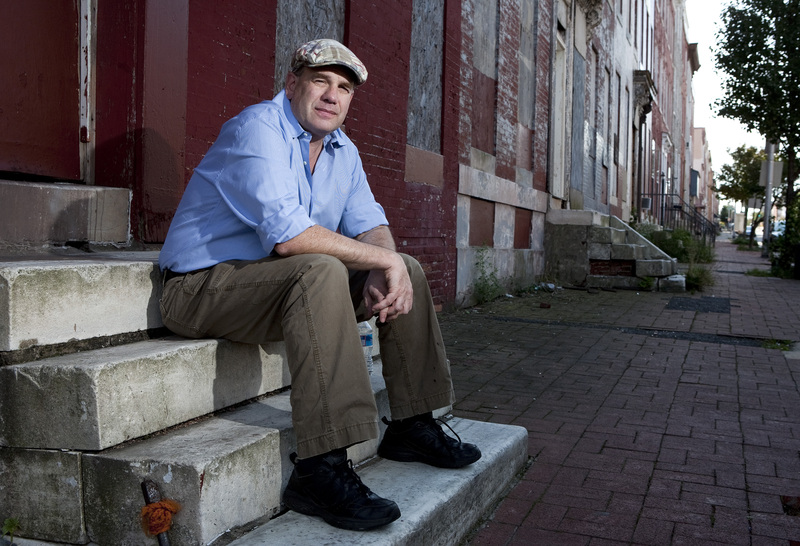 David Simon was born in Washington D.C. in the year 1960, his birth date for some reason being kept anonymous. He attended Bethesda-Chevy Chase High School in Bethesda, Maryland where he wrote for the school newspaper, The Tattler. While attending the University of Maryland, College Park, he also wrote for their independent student newspaper, The Diamondback; while working on which, he met a future writing partner in David Mills. During a leave of absence from the Sun, Simon wrote his first book, Homicide: A Year on the Killing Street in 1991. After a detective said to him, “If someone just wrote down what happens in this place for one year, they’d have a goddamn book”, and that is exactly what he did, proposing to the department that he’d “seem…like part of the furniture”; though he would not be in the background, as he even went on to help a detective with an arrest at one point. A Year on the Killing Street came out to glowing reviews, and the publishers were keen on the book being adapted to the screen. Simon suggested to them that they pass the book to Baltimore filmmaker Barry Levinson, who would later co-produce the award-winning television series Homicide: Life on the Street. Homicide was an American police procedural drama that focused on a fictional Unit of Baltimore Homicide, and was for the most part based on Simon’s book and experiences tagging along with Baltimore homicide detectives. The show ran from 1993-1999, and as the show went on, Simon had a larger and larger role in its production, leaving his job at the Sun in 1995 to work on Homicide full time; working as a story editor from 96-97, and as a writer and producer for the show from ‘97 to the end of its run in ‘99. Simon has since said that the show was a remarkable drama, but did not reflect the books nearly enough; which is most likely because it was broadcast on NBC, and was not permitted to be nearly as realistic or gritty as Simon’s later work would be at HBO. In 1997 Simon co-authored his second book with another future writing partner and collaborator Ed Burns, a former Vietnam War vet turned Baltimore homicide and narcotics detective turned teacher, entitled The Corner: A Year in the Life of an Inner-City Neighborhood, a genuine description of a West Baltimore community and the drug trade that pervades it. Simon was given a suggestion by his editor John Sterling to observe a single drug corner and took a second leave of absence from the Sun in 1993 to carry out his research; he became quite close to one of his subjects, drug addict Gary McCullough, and was devastated by his death while he was in the midst of writing the project. The Corner also received complimentary reviews, being named a Notable Book of the Year by The New York Times. The Corner was broadcast by HBO in the spring of 2000, a six-part miniseries based on Simon and Burns’ book. The show was written and produced by Simon and David Mills, a friend of Simon’s from the University of Maryland and fellow writer from Homicide. The miniseries featured performances by such past and future Simon collaborators as, Khandi Alexander (Treme), Reg. E Cathy (Homicide, The Wire), and Clarke Peters (The Wire, Treme) and won the Emmy for Best Miniseries, Movie, or Special, and both Best Writing and Directing for a Miniseries as well. The way The Wire came about was from the similarities that Simon saw between his frustrations with the bureaucracy at The Baltimore Sun and Ed Burns’ frustrations with the Baltimore police department when doing drug investigations using surveillance technology. Simon didn’t want to be limited by censorship and also wished to portray the city in a bleak light, which NBC wouldn’t allow on Homicide; HBO came around and agreed to produce the pilot, and Simon then approached the mayor of Baltimore to tell him of his plans, which were agreed upon. The Wire premiered on June 2, 2002 and, through its run until March 9, 2008, only received modest ratings. The critics praised it as one of the best cop dramas of all time though it was rarely bestowed awards and failed to garner a large viewership. HBO had faith in the show, and in Simon, and never held him back from bringing his vision to life; but somehow viewers were turned off by the realistic nature of the show, and as David Simon says to this day, The Wire never found its audience until it hit home video. After The Wire, Simon collaborated with Burns yet again in 2008 to make the seven- part HBO miniseries Generation Kill. Based on a book of the same name by writer Evan Wright, the show tells the story of his experiences as a reporter with the 1rst Reconnaissance Battalion of the U.S. Marince Corps in the 2003 invasion of Iraq. Like in all of his previous work, Simon made sure that every detail and nuance was verifiable and that the show portrayed the events as truthfully and as accurately as possible. Working on The Wire, David Simon developed a new interest; he describes the show as “really about the American city, about how we live together. It’s about how institutions have an effect on individuals. Whether one is a cop, a longshoreman, a drug dealer, a politician, a judge or a lawyer, all are ultimately compromised and must contend with whatever institution they are committed to.” Simon’s all-encompassing, Dickens-esque vision of Baltimore would later lead him to bring to life another American city that he felt particularly passionate about, New Orleans. In 2008 Simon began work on a new project with Eric Overmeyer, who wrote with Simon on Homicide and The Wire, on a project about musicians in post-Katrina New Orleans. Treme deals with themes beyond the plight of New Orleans musicians, it also depicts themes concerning political corruption, public housing controversy, the criminal-justice system, clashes between police and Mardi Gras Indians, and the struggle to regain the tourism industry after the storm; many of these themes were also present in The Wire, which is logical seeing as when dealing with an all-encompassing portrait of a city many motifs are going to overlap because all cities deal with the same fundamental issues. The show continues to develop Simon’s consistent, real-life aesthetic, and portrays the lives of an assortment of characters that all have a relationship to the city and the culture in some way. Treme also features many Simon regulars in the cast and the crew, and its third, and final, season is set to debut in late 2012. Like The Wire, despite getting unanimously positive critical reviews, the show failed to find an audience, and was fortunate to be granted a third season by HBO to finish the story that Simon and his team set out to tell. Sadly, just 12 days before Treme premiered, Simon’s longtime writing partner David Mills passed away of a brain aneurysm in New Orleans. He had helped write two episodes of Treme, and the finale of the first season is dedicated in his name. In the future, aside from wanting to write another book at some point, Simon is devising another HBO miniseries entitled Manhunt that “will focus on the 12 days after the Lincoln Assassination while John Wilkes Booth was on the run.” He is developing it with collaborator and long-time friend Tom Fontana, a writer for half the episodes of and producer on all the episodes of Homicide: Life on the Street, and creator of the first one-hour HBO drama series, Oz (which was also produced by Barry Levinson.) Over a dozen cast members from Oz went on to appear on The Wire and many cast members from The Wire, who weren’t already on Oz, would later appear in Oswald State Penitentiary for the final season of Oz in 2003. Both of their returns to television, and to HBO in particular, will be warmly welcomed when, and if, Manhunt comes to fruition.